Is climate change really killing 400,000 people a year? A new report out by an international consortium of scientists and policymakers makes the somewhat surprising claim that climate change is already killing about 400,000 people a year, through a combination of its effects on disease and hunger. This certainly sounds like a big number, and would account for almost 1% of the roughly 50 million people that die around the world each year. Reading up on the report's methodology a bit, it looks like they arrive at this number by thinking of all the things that can kill you, assembling estimates from the literature of how effective these things are in doing so, and then combining these with estimates of how much these things might be affected by climate. They do this at the country or grid level and then add everything up to get a global estimate. This approach at getting at climate impacts is not unlike that taken by Integrated Assessment Models in the broader climate impact debate: you try to directly account for all the stuff that might be going on that affects your outcome of interest. The appeal is that you can get really down and dirty in the details and try to model everything that is going on. But this complexity is also a source of difficulty, since we don't always have good estimates of how climate affects each intermediate variable, and it's hard to know how to add things up without under- or over-counting (e.g. is a person who dies from malaria the same person who's going to die from hunger?). You could imagine more "reduced form" ways at getting at the same thing: e.g. a study that looked at the direct effect of past climate variation on mortality. The disadvantage with this approach is that it is hard to illuminate the intermediate variables that link climate and mortality, but the advantage is that you avoid the adding-up problem of the more "integrated" approach. Put simply, your headline impact estimate might be more trustworthy, but you're probably going to understand it less. I don't know of a good paper that has directly looked at the relationship between climate and overall mortality (although a working paper by Kudamatsu et al is a step in that direction), but there is a nice paper from Baird, Friedman, and Schady (undated version here) that tells us how much infant mortality goes up when aggregate economic productivity declines in poor countries. We can combine this with another nice recent estimate from Dell, Jones, and Olken (ungated here) of how aggregate economic productivity responds to temperature change to derive an estimate of the effect of climate on infant mortality via economic productivity. Economists are perhaps overly-comfortable assuming that aggregate economic measures such as GDP capture most of what we care about in terms of a country's well-being, but it's not a bad place to start. - Dell Jones Olken estimate that a 1C increase in temperature reduced GDP growth rates in poor countries by 1.3 percentage points. - IPCC AR4 estimates average surface warming of 0.13C per decade since 1950 - so 0.013C per year. - The UN estimates that there have been 6.4 billion births in less developed countries between 1950-2010. Infant mortality rates over the period average 91 per 1000 births in these regions. Combine these and (if I did the math right) you get an estimate that warming since 1950 has resulted in an extra 2 million infant deaths in the developing world. This gives you a per-year mortality estimate of a little less than 40,000, or about an order of magnitude smaller than the estimate in the new report. 2. The reduced form estimate only considers effects on infant mortality, and perhaps a lot of adults are dying and driving up the "integrated" estimate. 3. There is an adding-up problem in the 400,000 number. Some part of (1) is undoubtedly true, but personally I find it hard to believe that GDP would not pick up a lot of climate's effect on a country's mortality outcomes - at least more than 10%. (2) seems unlikely, and the report notes that most of the 400,000 deaths are children. So I'm worried at the culprit might be in part (3): it's just hard to know how climate impacts every possible way people die, and it's maybe even harder to add up these impacts. It would be nice if someone wanted to repeat the Baird et al paper but just run climate as the independent variable instead of growth, which would give us a direct estimate of climate on infant mortality. Until that time, while it seems almost certain that climate change is already killing people and will kill a lot more in the future, we might be a little skeptical that the effects are already anything like 400,000 climate deaths per year. We tend to focus in this blog on the major crop commodities. For starters, they provide the bulk of human and livestock calories. They also tend to have the best data to attract geeks like me. But there are plenty of other interesting crops in the world. A few years ago my colleague Chris Field convinced me to take a look at potential effects of climate change on California’s perennial crops. One interesting aspect here in the Golden State is that growers have to make long-term commitments to crops. If they decide to plant a particular variety of almonds in a field, the chances are that it will be 20 or 30 years until they replant that same field. Trends in climate can be important for decisions today in a way that we just don’t see with a crop like corn or soybean. To make a long story short, we looked at county weather and production data for all of the top 20 most valuable perennials, and for those with clear relationships with weather, then projected impacts for the next 50 years. Since it is a study based on past data, the usual caveats about not considering potential game-changing adaptations apply. Projected yields for four of the crops with the clearest yield-weather relationships are shown below. (More details and results for other crops are in a recently published paper here). Blue line shows mean projection, light shaded area is 5-95% confidence interval. Most crops showed fairly small impacts of climate changes. For example, almonds are the most valuable single crop in California ($2 billion per year), and they seem to do better with warm springs (although warm winters are clearly bad). Some experiments done on orange trees also suggest some real benefits of higher CO2 for most tree crops, but we did not include CO2 effects in the study. So overall the direct impacts of climate change on crops in California seem less important than the indirect impacts of warming and sea level rise on water supply. But there is one crop that seems especially vulnerable: cherries. Now, cherries are “only” a $100 million per year crop, putting it down at number 18 in terms of value in the state. But they are a perennial favorite (pun intended) at farmers markets in early summer. And watching how cherry growers adapt to climate change might hold some interesting lessons for other crops. Some local reporters picked up on the cherry results, and went out to talk to local farmers. One could argue that they “cherry picked” the most pessimistic result to focus on, but I think their story does a really good job of explaining the reasons cherries are sensitive, and how farmers are noticing the changes. There are also two companion stories on water and pests that I found really interesting. Check it out at KQED's Quest website or below. So today they released a revised GDP growth rate for the Spring quarter that was 1.3%, down from an initial estimate of 1.7%. The revision was blamed mainly on the heat/drought that devastated crop production in the Midwest. Now, that crop devastation was bad news for the world as a whole, but I'm not so sure it was bad for the narrow interests of the US. We're the world's largest exporter of staple food commodities, and commodity prices went up a whole lot as a result of the losses. Further, those higher crop prices will stick around at least until next year, boosting farm incomes considerably. So, ironically, the U.S. is probably better off as a result of a bad harvest. Real GDP doesn't reflect the price benefit of exports because real GDP holds prices fixed at a baseline level, so it just measures the physical losses of the crop. This is quite unusual, I think, for a downward revision of this magnitude to actually be a good thing. But let me emphasize again: that's good for the US, not the world as a whole. Anyhow, since the revision really had to do with the weather and not general recovery, probably only helps the financial position of people living here, and the revision in job counts was all positive, I'm not surprised the stock market went up. Joanna Foster at the New York Times Green Blog discusses how discount rates affect estimates of the social cost of carbon---the "price" we all would have to pay for emissions to bring them down to an efficient level. A new study suggests we should use a lower discount rate, which indicates much higher carbon prices. Michael Greenstone, who led a study by the President's CEA, seemed to think the rate his study used was just fine. A little background: There are many assumptions that go into estimating the social cost of carbon. We need to think about impacts of climate change on sea level rise, agriculture, coral reefs, fisheries, recreation, human health and on and on, each of which is controversial in its own right. But the biggest overarching assumption is, by far, the choice of discount rate, which coverts projected future benefits and costs into today's dollars. The starting point for thinking about discount rates is to look at real interest rates, which equal nominal rates minus expected inflation. In theory, real rates should be tied, first and foremost, to projected economic growth. The idea is that the richer we become, the less we will value additional wealth, and so the more we'd prefer a dollar today when we are relatively poorer over a dollar tomorrow when we expect to be relatively richer. So, if we expect our offspring to be much richer than we are, we should use a higher discount rate and a much lower price of carbon, because our descendents will be able to absorb the costs climate change much more easily than we can afford preventing the change. If we expect little growth, the discount rate should be lower, the price of carbon emissions would be higher, and we should work harder now to reduce emissions. Using data to project long-run real interest rates is difficult because we don't have particularly good measures in history, since nominal rates combine expectations about inflation and future real rates. 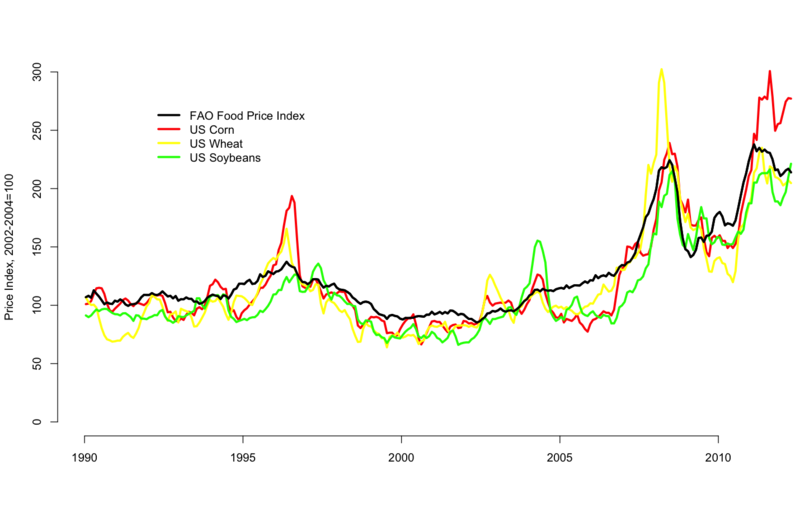 But since the late 1990s, we can observe long-run real rates on inflation-indexed treasury bills. These rates are now at the lowest in history, and if we had inflation-indexed bonds going back to the 1960s, today might still be the lowest. 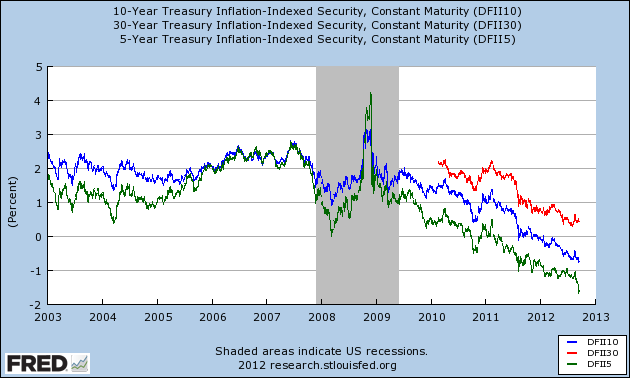 From FRED, here's the available history of 5, 10 and 30-year inflation indexed bonds. The old saw in economics is that baseline real growth is on the order of 2 percent per year. That rate also roughly matches the data for 10-year rates prior to crisis. Since then, however, real rates have steadily declined and are now firmly negative for 5-year and 10-year rates, while the 30-year rate is at about 1/2 %. I see two ways to interpret these data. One is that this is just what happens in a really bad recession, and in the long run we'll pull out of this and get back to 2% real rates. Another is that expectations about growth have become a lot more dismal. After all, the 30-year rates mostly cover a period well beyond current business-cycle considerations, and even these are relatively tiny 1/2%. My guess is that the combination of these two things like explain the low rates: this is still a bad recession and expectations about the long-run future have declined as well. Anyhow, to the extent that we believe long-run rates are down because expectations for long-run growth are down, and that these rates are accurate reflections of the future, I'd say the discount rates used in pricing carbon emissions are probably too high. The question is, where's the rethink in policy analysis given rates have fallen so much in recent years? Consider: the 30-year rate above, at 1/2%, is smaller than any rate being considered. And that doesn't take risk premiums or uncertainty into account, and both of these theoretically push the rate lower. The risk premium is negative because investments in curbing emissions will pay off most if climate change turns out to be worse than expected. Weitzman has a nice piece showing why discount rate uncertainty means we should err on the low side. Given the data, and the basic reasoning here, I was disappointed to see Greenstone brush off the issue so casually. It's the critical question and one that should be continually revisited. Fed Policy or the Weather? the Fed stated that money supply rose 0.3% the latest week alone, causing the annualized 3 month gain to increase to 8.6% and the yearly gain to increase to 7%. And then the U.S. consumer price index rose 0.6% (annualized 7.4%) in August. So, it is clear that unless the European debt crisis again worsens and again causes a surge in demand for dollar assets, there will be a big increase in price inflation soon. 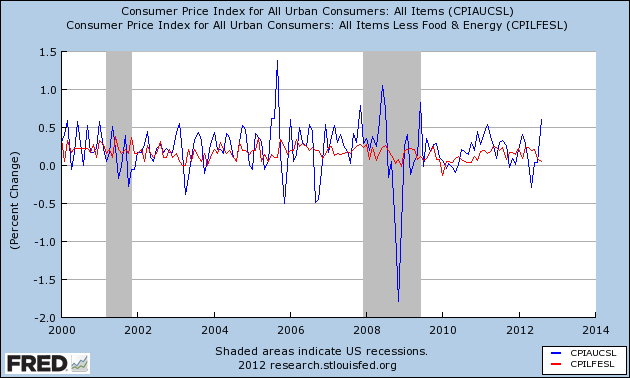 So, here is a graph that does put August's inflation numbers in context. Blue is monthly percent change in the CPI and red is the monthly percent change in "core" CPI, which removes food and energy (which are more volatile). The two obvious points: (1) the monthly CPI is crazy variable; (2) the recent spike in the CPI was all energy and food; everything else declined. Maybe, just maybe, the pattern can be explained by the drought and heat we experienced this summer, which caused some big crop losses. I think it's safe to say monetary policy didn't have much to do with it. Originally the title to Karlson's post was "Inflation, Inflation, Inflation!" It's a little more tame now. I was asked to comment on the 2012 drought, by the Chicago Council on Global Affairs. They have been active in food issues the past few years as part of their Global Agricultural Development Initiative. I especially like their weekly newsletter (despite its title "Food for Thought", which I suspect tops the list of most over-used phrases in the world). It's a great a way to follow different stories in the media, especially on the status of production and policies in other countries. you can sign up for it here. You can see my post here and the rest of the drought series here. Why is FAO's food price index up only 6 percent? "Drought has devastated crops around the world this year, including corn and soybeans in the United States, wheat in Russia and Australia and soybeans in Brazil and Argentina. This has contributed to a 6 percent rise in global food prices from June to July, according to United Nations data"
So why is FAO food price index up just 6% (the implicit reference in the NYT article) given the much larger spikes in corn, soybeans and wheat? Rice prices--another key staple--remains subdued due to large inventory buildups in India and other places. Still, I don't get it. I hope this means the world is dealing with crop shortfalls better than in 2008. Maybe other relatively minor crops are making up the difference. But I wonder if it's just a matter of time before the FAO index shows a larger spike as well.